Hello! It's time for a special Giveaway again! It took me this long to announce it because I was quite confused about the prizes. I wanted to give products that you all would LOVE. I asked in IVC Facebook Page what you all want with all your heart and soul, and the product that topped the list was Urban Decay Naked 2 Palette. That was my first option too. BUT if I picked that, it'll just be one prize since it's pricey, and I wanted to give at least two (always two) products. I will surely include the NAKED 2 in my next giveaway. After a lot of thought, I went with my instinct, and picked my most loved products. YSL Rouge Volupte Shine Lipstick ~ Shade of WINNER's choice! Because I just can't get enough of them & want them ALL! So I want to gift 1 to one lucky IVC reader. Sleek Oh So Special Eyeshadow Palette ~ Because it's a very versatile palette, great for everyday & party looks. I've swatched it here. - This Giveaway is open worldwide. - Closing Date/Time: 24th September '13 at 11:00 pm IST. - WINNER will be picked randomly & will be announced/emailed shortly after closing date. Update: Your comment might not show up, because the page cannot load all of them. But if you have clicked publish, it has probably reached my dashboard. So, you don't have to post it more than once. December 2011 wen i bought my Bourjois palette . . . Loved it at first sight. Happy 4th Blog Anniversary CZ! Amazing giveaway! Fingers crossed!! I have started following your blog since early 2013. I found your blog on google when i was looking for some cosmetics swatches.. And now i am a regular reader and a huge fan of Indian Vanity Case!! You are doing such a great job! Fingers crossed! Lots of love!! Basically the first blog I followed was yours! I was following ivc from january 2011 and from that day I m crazy for ur blog and I check it twice a day!! I think I found your blog through a pin on pintrest? I've been following for maybe a year? I don't remember, it was a long time ago. found you ages ago...4 years maybe now...i dunno how and when......... but I love how colourfull your blog is and howwww lovely you are. hey im really sorry i put some wrong link in the tweet option first , but then corrected it with the right link. Found your blog through cosmp beauty awards! Hello Cynthia :) Well how I found your blog is quite a story in itself! A few months ago, I was really really sick, and was on complete bed rest...I found your blog while googling for beauty-related blogs...I was then hooked! I found your blog really cute, with the whole pinkness and bows going on...plus, you write really well :D You'll find this hard to believe, but during the next one week, I had absolutely nothing to do, and laying in bed the entire day, I read almost EVERY SINGLE blog post of yours! Even the first one, the one about the Vaseline body lotion =D Been a silent reader since then :) You're a lovely lady with a lovely blog, congratulations and God bless you! You are such an inspiration, I've learned a lot from you. 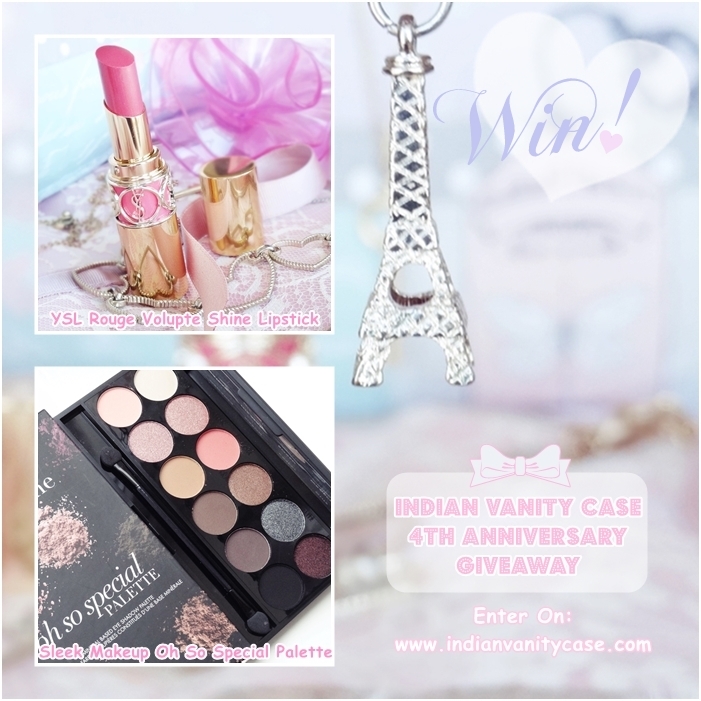 I was searching for a product review and i entered in Indian Vanity Case blog. Then, I add you in my bloglovin. Happy Anniversary IVC! You're amazing! I found IVC in 2010 when I was looking for eye kohl reviews.... The whole pinkiness and cuteness and honesty got me hooked! I was searching for a review at spring and I must be a follower because you have nice style photo. I love your style. Congratulation. I really love your blog & the effort you put in. Your blog posts are always so different than other's posts! It always has either a darn cute story or a great theme. I can't tell you how much I love your blog. Don't ever stop blogging or many of us might just cry. I came across your blog while looking for maybelline lipstick If I'm not mistaken.. I was looking for swatches and review about maybelline lipstick but I can't really remember which one.. I guess I started following your blog from last year.....I was googling for some swatches and reviews on something n your website was the first in list. Ever since I'm a huge fan n follower of ur awesome site! I found it on cosmo fb page.. I was checking out all the nominees for various awards to be given in the magazine. I was interested in beauty blogging sites and there were a myriad of names there. I was trying to pick one and the name "indian vanity case" stood out amongst other, so , i checked it out. Boy! am i glad i found it! That is how much I enjoy it. Just wanted to wish you a Happy blog anniversary. I have been reading and following your blog since past 6 months. You are doing a commendable job. I m inspired by you so much that I want to become a makeup artist soon and I will also start my blog someday. Will always give examples on how beautifully you work. Its just a well chosen giveaway. I have never been a winner of any giveaway but I always find it very exciting not because its FREE but because this is very special to me as an inspiring makeup artist!! I love you work and your pretty face!! Keep up the good work! You are a champion!! I found your blog a year ago I think but I can't remember how! I want so much sleek palette! Happy 4th blog anniversary :) I've only known your blog for some months but it is one of the most lovely to read - the pictures are always of amazing quality and your thoughts are fun to read. Thank you for the work you put into this blog. I have been following your blog since early 2011, I was browsing and there I saw some awesome pictures in Google, I clicked and I am hooked since then. The beautiful posts, amazing write up and theose cuties bows and all girly things.. I love it..
You super cute OOTDs and fabulous eye makeups!! Congrats on the 4th anniversary..You are the ONE blogger who i think who has always remained the same..and became too professional in order to be more professional..!! I think I found your blog at a time when there were only a handful of indian beauty bloggers and we all used to comment on each other's blogs.. I think i found you either from poornima's blog..(Glitter Glamour Grace),Or Divija Reddy's or from Rima Kaur's or maybe from IMBB..I dont remember which.. But those were good ol' days!! I had been following your blog since 2011.I was new to makeup then. Was looking for some reviews when google showed me a bunch of beautifully clicked pictures. Ofcourse,those belonged to your blog. That entire evening,I was reading your previous post and next day whatever I had bought was on your reco. So, long story short, yours was the first blog that I had started following and loving to the T.
Your writing style keeps us connected with an added bonus of pretty and easy to copy eye makeup tutes. And some terrific makeup tricks, especially that eyelash curler one. I know this comment was long enough but I had to thank this beautiful lady who has inspired many a girls like me to go head over heels with makeup. Hay 4th anniversary to this blog. I don't remember the date. Earlier this year, I think January, or December last year. I was looking for wing liner/shadow tutorials, and I found your easy tutorial. I read it six times. :) I now do my own. I remember one of my friends Liked one of the pictres on the IVC fb page. It was a beautiful lip swatch. I opened it and had a look at the other pictures on the fb page and loved the blog! i found your blog 2 years ago.infact it was the very first one i got hooked to.i got inspired by ur tutorials and got introduced to makeup.love ur blog CZ! I'm pretty sure I got linked here through StumbleUpon! i found this blog accidently... and frm dat tym m hooked to it.. its lyk my daily dose of energy. congratulations on completing 4 years of dis blog......its been two years i have been following dis blog....n all i can say is I completely LOVE IT...!! !keep d good work going.........!!!!! Hi Cynthia :) I found this blog when I was searching for top ten Indian makeup blogs on net. From then on I started following IVC:) I totally love this blog :) bloggers like u are an inspiration for women to look even more beautifull. I am a new and a dedicated follower. Its only been few months but I dont remember clearly how I found you but I an so GLAD I did. Found your blog accidentally when browsing for lipstick reviews about two years ago. Fell in love with the blog immediately for its unique, personalized content. Congrats... i just love ur blog n i recently discovered it whn i was trying to find a website / blog from india which is similar to totalbeauty.com... n indeed i found a best indian beauty blog which is so much entertaining.. I think I found your blog a year back, but to be honest, I have no idea how or when exactly. I'm thinking I must have been googling for a review on an Indian brand and must have come across your blog :-) Anyway, have been a faithful follower ever since! hi CZ...congrats fr the success of ur blog...thanks fr the wonderful giveaway. i pounced on ur blog while searching for exfoliators back in 2010..that time,i didnt knew wat 'blog' was and then again came to ur blog while searching for lakme lipsticks and d pigmentation products...ur pomegranate face was and ponds micro dermabrasion kit review really really helped me..thanks for providing such grt reviews and knowledge!! congrats Cynthia! I found IVC while browsing for some product review - saw this lovely face in one of your makeup posts and got hooked to the way you write! congratulations first of all! OMG1 4 years...this is really a good experience must say! since when? its just been 6 months, but must admit i love the peachy coral shade of your blog.......everything is so girly, soft and cute! I found IVC when I was browsing for a review of a product I wanted to buy. I think it was an Inglot lipstick. i literally live for your lip swatches and eye tutes...keep going all the very best cynthia. Wow! I started reading your blog a little a year ago. My goodness has time flown by so fast and Happy 4th Blog Anniversary!! I hope your viewers continue to grow and that you keep doing what you do. Love reading all the post. I dont remember exactly when i started reading IVC, 3-4 years b4 i guess. First i thought some foreigner living in Indian, seeing your pics :p, out of curiosity i started reading and got hooked by the cuteness of blog . Congrats on your Blog's 4th anniversary. i found your Blog when i was searching for blogs by North-East Bloggers,that's when i got to know about you and have loved you ever since. many many happy returns of 4th anniversary.i found your blog when i was looking for ponds white beauty cream.i am always fond of winning competition so i am sending this comment. i found your Blog From Facebook! Can't remember how I found the blog - but definitely have been following for over a year! Hi happy 4th anniversary. I came across your Blog and Youtube Channel when i was looking for a review on the bourjois healty mix foundation, and healty mix serum foundation. i just found your blog because of the giveaway...i ran through your posts and i think it's great! Happy 4th blog anniversary CZ!! !I found IVC while searching for a review of a lipstick...it was more than 1 year back...from that day I reading IVC became a habit and I love all ur posts so much....way to go!!! I found IVC on google searching for something, may be acne, little more than 3 years back. And I'm following it since then and seen it grow beautifully! happy IVC anniversary! loving the giveaway!! i discovered ur blog when i browsed on google for indian beauty blogs and i wasnt disappointed at all ! love ur blog, and ur posts ! Heyy Congrats on completing 4 successful years of your blog CZ :) I have been a silent yet loyal follower of your blog since more than 2 years now.. i came across your blog when i was searching for a review on Ricci Ricci by Nina Ricci, and from that day i have been glued to IVC.. Cheers!! Congratulations for this awesome blog, I love reading articles on them. Happy 4th Blog anniversary and thanks for the giveaway! Congrats on your Fourth! !..Many many many many many more to come C!!!! I found your blog a mere two weeks ago whilst looking for reviews of products I was looking to buy! in 2012 when i was searching for some information on foundations and i subscribed immediately!!! i found your blog 3 years back, when i searched for BEST INDIAN BEAUTY BLOGS.. AMAZING STUFF, n d only blog i follow nowadays. all the best! Just found you today through a Google search! Well, I am one of the old followers.. I found you for quite awhile, when you post reviews with beautiful pictures and from there I've seen this website morph beautifully with more awesome shots you took! Hi cz, happy anniversary !!! I've been a fan for over a year now, I love to use your tutorials! I think I found you from google searching beauty blogs! Happy 4th Anniversary! I can't remember when I found your blog, but I have been a silent reader ever since. I have read all your posts, from your very first blogpost up to the latest one. :) And I enjoy every single post of yours. Thank you for your wonderful writings..
happy anniversary = I am a newbie and new follower. I found your blog on google. I found your blog last year when i started blogging.